WeekendSaver’s 103-Point Checklist Protects Your Budget Year-Round. Every 3 months you can schedule a WeekendSaver home service specialist to perform a safety and preventive maintenance check on your systems and appliances to make sure everything is working the way it should. No more spending weekends on home maintenance. We take care of it for you! 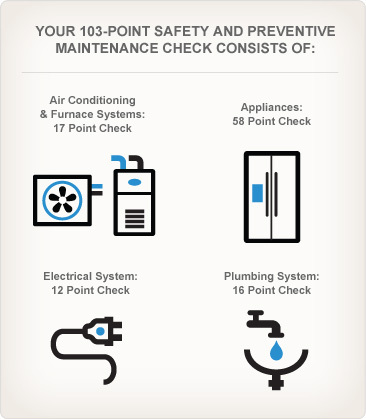 1 1 Home Preventive Maintenance checks available only after 30-day review period for active WeekendSaver Complete Home Preventive Maintenance Plan customers.